This is a magnificent Ganesha idol crafted in electroformed silver with an umbrella crown over it. The idol is adorned with ornaments and other beautiful accessories to create a spectacular look. The Chatar Ganesha is apt for religious ceremonies and gifting option not to be missed. This is a magnificent Ganesha idol crafted in electroformed silver with an umbrella crown over it. The idol is adorned with ornaments and other beautiful accessories to create a spectacular look. 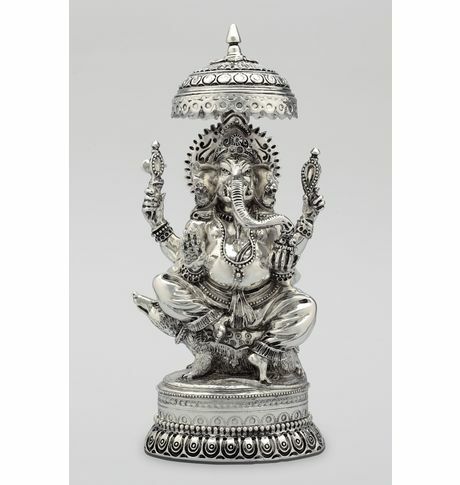 The Chatar Ganesha is apt for religious ceremonies and gifting option not to be missed.Electroformed Silver Finish Base Material: Resin Color: Silver. Easy to maintain.Cancellation and Return Policy: • Exchange allowed post booking • No order cancellation or Refund transaction allowed at the store.